Thank you to the parents who helped out at our Pumpkin Day and Halloween party! 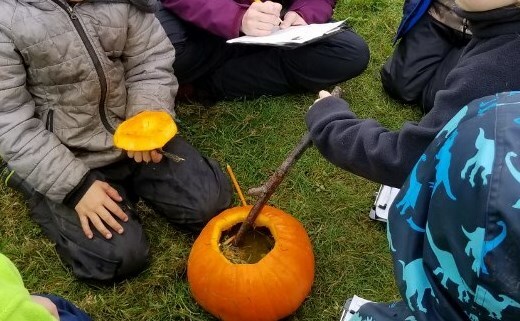 Students estimated, then counted pumpkin seeds by groups of 10, then made a witch’s brew. So much fun! During these activities, they were also practicing working in a group; being considerate of others’ ideas and following through on their role. Monday – At Aldergrove. LEPS Salmon Forest program. Salmon are spawning in our local creeks, so it’s a great time to learn about their life cycle and important role in the ecosystem. Tuesday and Wednesday – Brae Island days begin – meet at the washroom building near the main day use parking lot. Students should be ready for sand play as we spend a couple of days getting used to a new place. We’ll also be practicing our Poppy poem and discussing/reading about peace. Thursday – Remembrance Day Assembly after recess. Our class will join the other K classes to recite a poem at the assembly. Parents are welcome to watch. K students have a Dental Screening. Friday & Monday – No school. Enjoy a long weekend!